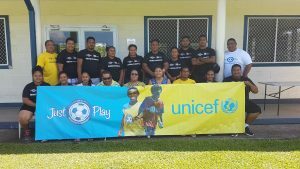 Samoa Football > News > Just Play > ‘Just Play’ – A Huge Success in Savaii. 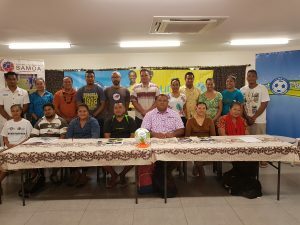 School Teachers and Volunteers from different schools and districts in Savaii have just completed a training program by ‘Just Play’ instructors Tunoa Lui and Atufili Talaia . The two-day course for teachers was held at Faga and Saleaula while the course for the communities was held at Tuasivi. Just Play’ Grassroots Project Manager Atufili Talaia was pleased with the response from the participants: “The course went very well. I can see that the participants showed great enthusiasm for the program. We have also received great support from all the school principals, teachers, and ministers from village communities”. As a result of this training program, the participants will be able to teach students on how to develop game skills and lead healthier lives. A total of 24 schools and 13 communities will be taking part in the six-week program in Savaii. Talaia also added: “We are very fortunate to be working very closely with the Ministry of Education Sports and Culture in delivering this program to the schools and communities. This program would also not be possible without the support of the Australian Government, UEFA, and OFC”. 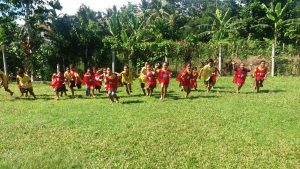 Over the next six weeks, the Football Federation Samoa (FFS) will continue to visit the schools along side the Ministry of Education Sports and Culture (MESC) to check up on the progress of the program as well as assist the teachers with running the program. FFS CEO Fred Young explained; “We are thrilled that the program is really taking off in Savaii. It will help the participating children both academically and physically. We also hope that through this program we will in the future have great football players representing Samoa at international tournaments“. ‘Just Play’ is designed for children between the ages 6-12 and is based around structured football activity. Equipment packs containing balls, cones, bibs, football rings, activity manuals, and other resources are distributed to schools, which enable children to play football at anytime and in any situation. ‘Just Play’ has been designed and funded by the Oceania Football Confederation and the Government of Australia. This program was already launched in Apia last year with 19 schools and close to 8000 children participating. Previous Post Toetu Petana elected FFS President. Next PostJoy at Football Grounds.